At Quarkslab, we like to play with Android devices. So the release day of the Samsung Galaxy S5 we gave a look at the firmware to search for issues. We quickly spotted a simple vulnerability and had a working exploit. The vulnerable application is UniversalMDMApplication, its goal is to make the user enrollment easier for the enterprises. 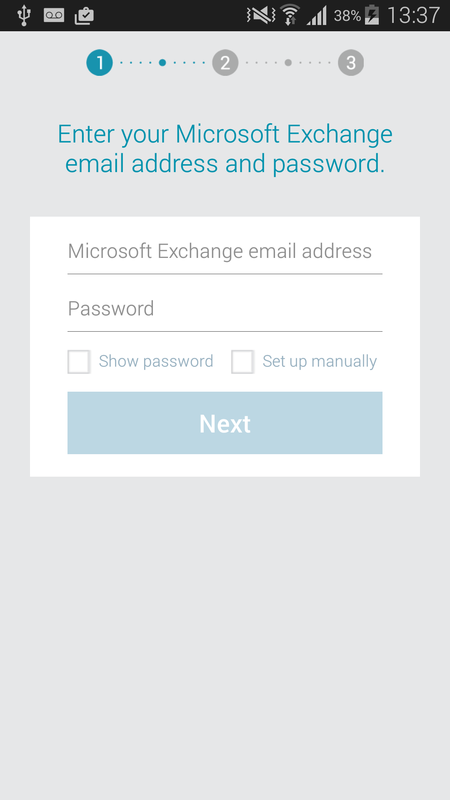 This application is present by default in the Samsung Galaxy S5 ROM (and many others) and is part of the Samsung KNOX security solution for enterprise. We kept this vulnerability undisclosed because we thought this could be a good one for the mobile pwn2own but the rules are stricter this year, maybe too strict (they removed the USB category because it means user interaction... come on guys...). With the new rules, the victim is only authorized to click one time, to open the malicious content and nothing else. So when the popup appears, even if most of the user will click on "yes", for the pwn2own guys it is already an invalid vulnerability. Even without the problem of "user interaction", this vulnerability has been patched in August on the Samsung Note 4 and Alpha but not until October for the Samsung Galaxy S5, thus can not be used anymore for the pwn2own. This article will describe how the vulnerability works and try to make developers more aware of this kind of bugs. A video showing the exploitation of the vulnerability is also present. April 2014 - Release of the Samsung Galaxy S5 and discovery of the vulnerability. August 2014 - Release of the Samsung Galaxy Note 4 and Alpha. The vulnerability is patched in their release ROMs. October 2014 - The vulnerability is patched in the Samsung Galaxy S5. November 2014 - Mobile Pwn2Own contest. Warning: This list is not exhaustive and others models can also be vulnerable. UPDATE: A way to patch the vulnerability is provided at the end of the article. 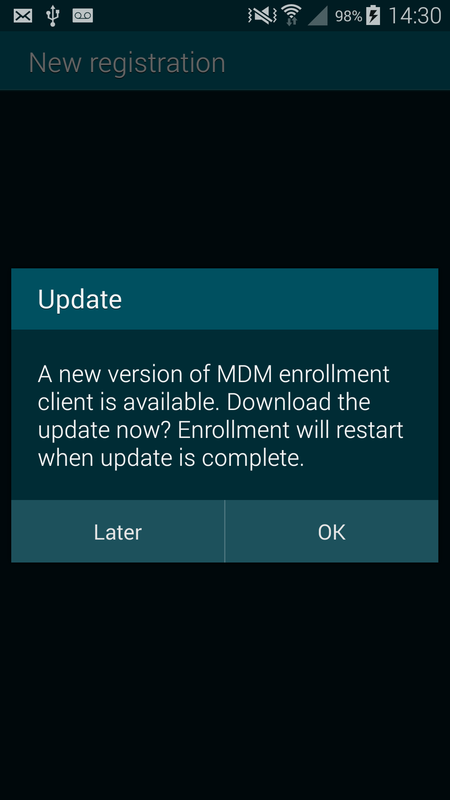 The UniversalMDMClient application is installed by default as part of Samsung KNOX. It registers a custom URI "smdm://". When an user clicks on a link to open an URL starting by "smdm://", the component LaunchActivity of UniversalMDMClient will be started and will parse the URL. Many information is extracted from the URL, and among them an update server URL. 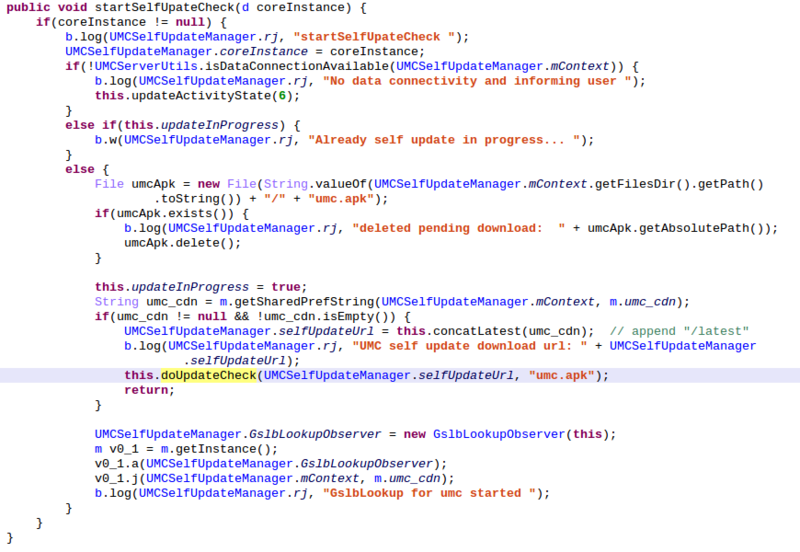 After having extracted the update server URL, the application will try to do a HEAD on the URL. It will check if the server returns the non standard header "x-amz-meta-apk-version". If this happens, it will compare the current version of the UniversalMDMClient application to the version specified in the "x-amz-meta-apk-version" header. 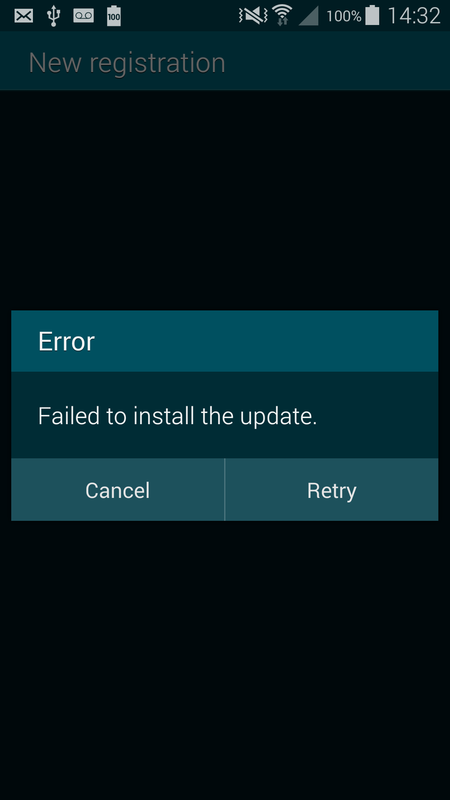 If the version in the header is more recent, it will show a popup to the user explaining that an update is available and asking if he wants to install it or no. If the user choose "yes", the application will do a GET on the update server URL and the body of the answer is saved as an APK file. Last but not least it will be installed without prompting the user about the permission asked by the application or checking the certificate used to sign the APK. Hence, if an attacker can trick the user into accepting the update, he can install an arbitrary application with arbitrary permissions. 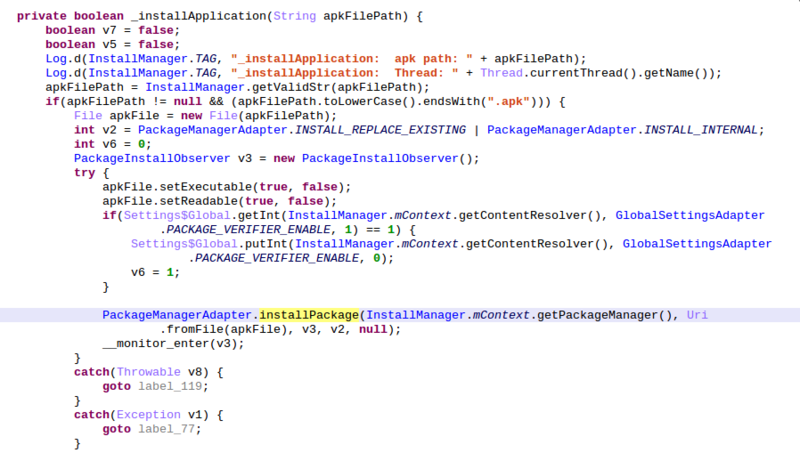 The vulnerability has been patched in October 2014 by checking if the package name of the downloaded APK is the same as the package name of UniversalMDMClient application. Since it is not possible to have two applications with the same package name and signed by two different certificates, it becomes impossible to install an arbitrary application. 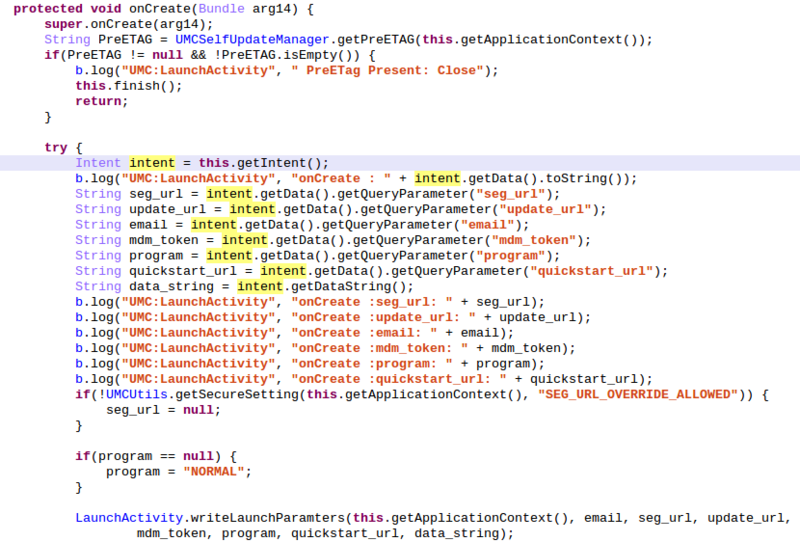 The intent-filter registers (line 11-16) the custom URI "smdm://" and associates it to the com.sec.enterprise.knox.cloudmdm.smdms.ui.LaunchActivity component. When the user (or his browser ;) ) will try to open a "smdm://" URI, the onCreate() method of LaunchActivity will handle the situation. From here, we will dive into the code. Besides the application has been ""obfuscated"" by proguard, it is not really a problem to analyse it using the JEB decompiler and his ability to let the user rename methods and classes. The first thing done by the onCreate() method is to check (via the function getPreETAG()) the presence of a file named PreETag.xml inside the directory /data/data/com.sec.enterprise.knox.cloudmdm.smdms/shared_prefs/. If the file exists, the application aborts its execution by calling the finish() method. By default, the file PreETag.xml does not exit. Inside this function, a ContentTransferManager class instance is initialized and a HEAD HTTP request is performed on the attacker controlled URL. The different states which will be encountered during the life of the HTTP request are handled by the handleRequestResult class and methods onFailure(), onProgress(), onStart(), onSucess(), etc. The most interesting method is of course onSucess(). It checks that different headers are present : ETag, Content-Length and x-amz-meta-apk-version. 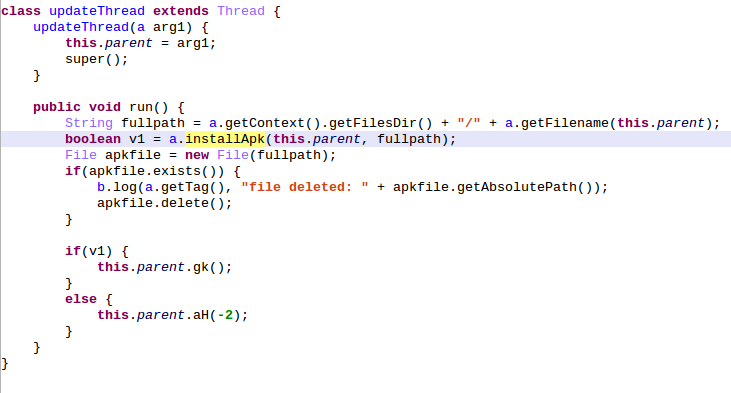 The value of the header x-amz-meta-apk-version is compared to the current UniversalMDMApplication APK package version. If the header x-amz-meta-apk-version contains a number bigger than the current APK version, then an update is needed. At this point a popup appears on the screen of the user, explaining that an update for his application is available and asking if he wants to install it or no. If he chooses yes, we can continue our analysis, and the attack. And... that's all. At no time the download APK authenticity is checked nor the asked permissions are showed to the user. Hence, this vulnerability allows an attacker to install an arbitrary application. Once the update have been installed, it is not possible to exploit the vulnerability anymore because when a successful update has been installed, the value of the ETag header is written in /data/data/com.sec.enterprise.knox.cloudmdm.smdms/shared_prefs/PreETag.xml, and the existence of the file is the first check done inside the onCreate() method of LaunchActivity. If the file already exists, the method calls finish() and the execution aborts. In order to prevent the installation of an arbitrary APK, the application now checks the package name before installing it. The APK package name must be the same that the package name of UniversalMDMApplication. This means that the APK must be an update of UniversalMDMApplication and signed by the same certificate. Thus it is not possible to install an arbitrary application anymore. How to patch it yourself ? In fact, by clicking on the link, the vulnerable application will be launched but without a specified update URL it will use by default the Samsung UMC (Universal MDM Client) server http://umc-cdn.secb2b.com:80. This server hosts the last version of the UniversalMDMClient.apk available and installed on the patched models (Samsung Galaxy S5, Note 4 and Alpha). Because this version is more recent than the vulnerable one, the application will download and install it, you are safe now. We conducted a study on the security of the Samsung OEM application in 2013 (slides here ) on the Samsung Galaxy S3. We proved at the time that it was possible for a local and unprivileged application (0 permission was needed) to take full control on the smartphone and build a 0 permission backdoor by exploiting vulnerabilities inside OEM applications.